iMake's The Grainfather is an all-in-one RIMS brewing system designed to be used indoors with household electric current. 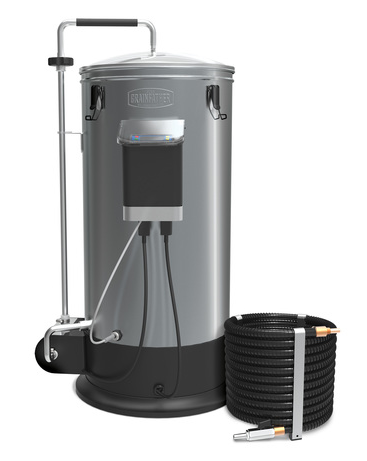 It includes the kettle, grain basket, recirculation tube, pump, electronic temperature controller, instruction book, and counterflow chiller. It does not include a mash paddle, fermenter, cleaning supplies, or pretty much anything else. The price is around $800-900 depending on where you shop and the discounts offered. The Grainfather handles mashing, boiling, recirculating, sparging (to a degree), and chilling of the wort. You'll still need a fermentation vessel of some sort and some other supplies we'll discuss later. Assembly of The Grainfather in my experience was pretty easy overall. There were a couple of steps I didn't think were as well documented in the manual as they could have been, but consulting with the pictures in the book was a big help there. I'd say maybe 15-20 minutes of effort was involved. Before using The Grainfather, it's recommended that you clean it. You do this by filling it with hot water (or cold water and heating it) and adding PBW or a similar cleaner. Circulate the cleaner through the pump, recirculation tube, and counterflow chiller. Wipe down the insides and outside of the kettle with the cleaner. Discard the cleaning solution and rinse with clean water from the tap. Rinse again (my recommendation) and then circulate the water through the recirculation tube and counterflow chiller to rinse those out. Now you're ready to brew. Before you begin mashing in with The Grainfather, you need to decide how you're going to sparge the grain when you're finished. There are two recommended ways of doing this, depending on the time and equipment available to you. Another method, which is what I personally use, is to wait until about 30 minutes before the end of the mash period. I measure the sparge water into my old brew kettle, set it on the kitchen stove, and bring it to a boil. This way I can begin mashing immediately. The down-side of course is that you'll need a second heat source to heat this other kettle and water, and you'll need to own another kettle. The Grainfather manual contains formulas for calculating mash water and sparge water. You are told to use these formulas in place of the ones in the recipe you're working with, as they're tailored to the way The Grainfather functions. The Grainfather app for iOS and Android can calculate the water volume as well. The formulas are based on the amount of grain involved and the recipe volume. You'll begin mashing by calculating and measuring these amounts of water. Next, you'll set the controls on The Grainfather to heat the mash water. The mode switch near the bottom of the kettle should be set to "normal" (boil) mode at the start of the heating process. Depending on the mash temperature, you may later adjust this to "mash" mode. You press and hold the "Set" button to enable temperature setting, and the up/down arrows to dial in the desired temperature. Once the temperature is correct, press "Set" again to lock it in. 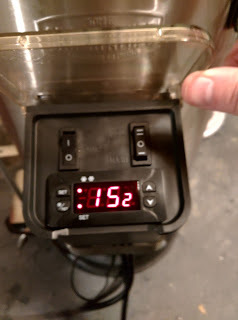 The Grainfather will now begin heating the mash water to this temperature (in degrees Fahrenheit). In my experience, it stays within 1-2 degrees of the set temperature throughout the mash. If your recipe calls for a step mash, you'll need to change the temperature setting periodically according to the mash schedule. The Grainfather, in my experience, heats 5-6 gallons of water approximately 1-2 degrees Fahrenheit every minute. So if your mash water starts at 52F and you need the temperature to be 156F for your mash, you'll need between 26 and 52 minutes to get the water up to temp. This is one downside to The Grainfather compared to a propane or 220V electrical heating element. It's not exactly fast. On the other hand, you can use The Grainfather indoors so long as you've got enough space and ventilation to handle the steam coming off the kettle during the boil... so you can brew year-round. Once mash water is at temp, you'll begin stirring in the grain. I recommend taking your time with this and doing maybe a pound at a time, as this will ensure that it all gets moistened. After all your grain is in the water, you'll carefully insert the lid into the basket over the overflow tube and place the overflow cap on the tube. You'll start the recirculation pump at this point and the mash is underway. When the mash is finished, you'll set The Grainfather's temperature control to an appropriate mash-out temperature and wait a few minutes for it to reach that temperature. Next, you'll insert the handle into the grain basket and lift it up out of the kettle and onto the ledge built into the rim of the kettle. The wort will start draining through the grain bed and dripping into the kettle. By now, your sparge water should be at the desired temperature and ready to use. Carefully pour this into the kettle, making sure it doesn't reach the overflow cap and slip past the grain bed. In my experience with grain bills in the 10-16 pound range, sparging will take at least 30 minutes. If you remove the grain basket too soon, you'll find that you leave a lot of wort behind. It's better to be patient and get as much value from your grain as possible. In my early batches with The Grainfather, I had quite a few issues with mashing. 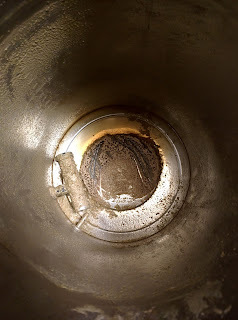 Sometimes enough dust would settle out of the grain into the kettle that it tripped the kettle's thermal cut-out switch or scorch protection capability. When this happens, there is no obvious audible or visual indicator, other than the fact that the mash temperature starts dropping gradually. To reset the switch, you have to reach all the way UNDER The Grainfather to press it. This happened enough in the early batches that I built a short wooden platform on which to place The Grainfather, with enough room under it that I could reach the switch. ent is located. When you've removed enough of the residue, you can SLOWLY reinsert the grain basket and get the mash back up to the desired temperature. The unfortunate part here is that this loss of temperature will probably screw up the mash. For instance, if you needed to maintain 152F for 60 minutes, but the thermal cut-out caused the temperature to drop to 124F early in the mash, you've unintentionally done a step mash that will probably result in a drier beer than you intended. I've found that by gently shaking my grain bill in another container before mashing will tend to make the dust (which is mostly what causes these scorches) to settle to the bottom of the container. I scoop the bigger bits of grain into the kettle first, dropping the dust into the kettle last. This puts the dust up top where the grain bed filters it a bit, and seems to minimize the scorching for me. I've also found (and your mileage may vary here) that if I heat my sparge water on the kitchen stove starting about 30 minutes before the end of the mash, that it will be almost exactly where I need it to be when the mash completes. You may want to experiment with this and determine, based on your own kettle and stove, how long it takes to get water to sparge temperature. 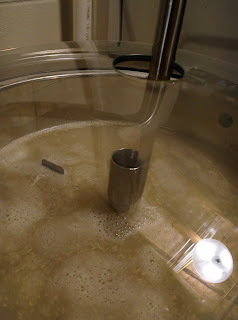 Next week, I'll talk about the boiling and chilling processes with The Grainfather and my experiences with those. 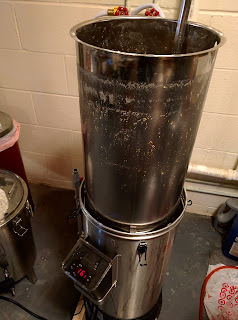 In Part 3, I 'll talk about cleaning and other overall notes about brewing with The Grainfather. In August 2015, I started looking for a good Belgian Quadrupel recipe. I found a few, but only one of them intrigued me enough to make it. It was called "Dixie Cup Boardwalk Belgian Quadrupel" and appeared in BYO magazine back in 2007. Apparently it was given to attendees of a homebrew competition in Houston that year. It took a month or two to gather up the ingredients. The malts were easily found at RiteBrew.com, but it took me some effort to find Grains of Paradise. It also took me some time to locate Turbinado Sugar until I thought to check the local Whole Foods. At the last minute, I found that I didn't have the Perle hops the original recipe called for, and didn't have the full amount of Northern Brewer either. My pre-boil gravity was on target, but at the end of the boil I found that I needed to make some additional modifications. What appears below is the version of the original BYO recipe that I ended up making. The Grainfather's Android app suggested using 5.5 gallons of mash water and 2.3 gallons of sparge water. I measured out these amounts and set the controls to heat the mash water to 152F. The sparge water was poured into a 5 gallon kettle and placed on the kitchen stove to heat to boiling. PH Stabilizer was added to the kettle to aid in conversion. The grain spent 90 minutes at 152F and 10 minutes in mash-out at 167F. Sparging took about 30-45 minutes. The resulting wort volume was 6.5 gallons according to The Grainfather's kettle markings. The wort was brought to a boil and a 90-minute boil timer started in The Grainfather app. At 30 minutes into the boil (60 minutes left), the hops pellets were added in a bag. With 20 minutes left in the boil, the raisins were added, in a bag. With 15 minutes left in the boil, a whirlfloc tablet was dropped into the kettle. With 10 minutes left in the boil, the wort began recirculating through the counter flow chiller to sterilize it. With 5 minutes left in the boil, the turbinado sugar, candi syrup, coriander, and grains of paradise were all added. I checked the volume and it was around 5.5 gallons. Gravity was considerably lower than the recipe called for (I showed 1.065 vs. the 1.090 the recipe expected). I planned to increase it by boiling off more wort without the three bags in the kettle, but the bags had all dropped into the kettle and weren't easily retrieved anymore. At this point I added more candi syrup and the brewer's crystals to bump the gravity up to 1.085 (these additions all appear in the ingredient list above). This was still below what the recipe called for but I decided it would have to be close enough. When the boil started, I sanitized my fermenter and blow-off tube. I had these ready when the boil finished. The Grainfather's pump transferred 5.5 gallons into the fermenter at 1.085 SG, 22 Brix, per my refractometer. Owing to some sediment in the kettle (which lowered the flow out of the kettle) and the extra-cold (52F) tap water, I was able to pump wort directly from the kettle, through the counter flow chiller, and into the fermenter at about 66F. I inserted my oxygen stone into the wort and began letting pure oxygen flow slowly through the wort for 2 minutes. I removed the stone, pitched the two yeast packets, buttoned up the fermenter, and set up the blow off tube. The fermenter was wrapped with a fermwrap heater connected to a temperature controller. The controller's probe was in the fermenter's thermowell to get a good measurement of the wort temperature. I set the temperature controller to 70-74F since the original recipe called for a 72F fermentation temperature. I learned the next day that the controller wasn't getting a good temperature reading and heated the wort to around 80F instead of the intended 72. I adjusted this when I discovered it, and the temp dropped. A sample of the wort seemed to indicate that the unusually high temperature did not hurt the beer at all. It tasted better than many I've made to date. The original recipe called for 3 weeks at 72F. After the brief stint at 80F, I reduced the temp back to 72F and held it there for three weeks. The beer was racked to a secondary fermenter for a couple of weeks and then bottled. At the time of this writing (Feb. 17) the beer is in bottles and conditioning. I expect to be able to open the first sample at the end of the month. If it matches the taste during bottling, it'll be a winner. 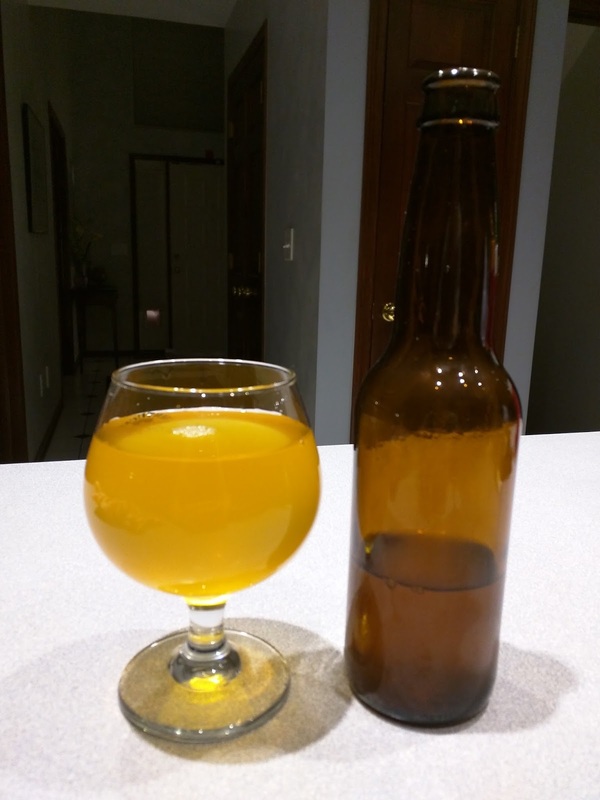 The photo at left shows a bottle of the brew with my board game themed label, poured into a glass. The beer is mildly carbonated and does develop a thin (half-finger-thick) head but it doesn't last long. I snapped the photo here really quickly and you see how little I got in the photo. The beer pours a very dark mahogany. Until you hold it up to a bright light, it's a dark brown color. The head is thin, beige, fleeting, and leaves behind no lacing. The aroma is a delicious mix of dark fruit (raisin), sweet malt, and just a hint of noble hops. But hey, a beer can look and smell fantastic, but if it tastes like boiled dog blanket no one's going to want to drink it. Fortunately, this beer can back up its other qualities. 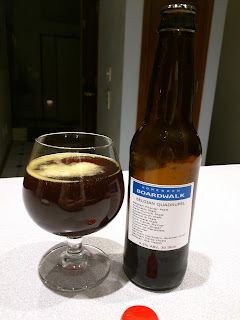 The beer has a near-equal balance of warming alcohol, sweet malt and dark fruit, and hops bitterness. Those who have tasted this one have marked it among the best I've made to date. The warming note is pretty strong, probably because the fermentation temperatures were a bit high. This adds a sweetness that balances well against the hops bitterness. Raisins and plums come through in the middle. The finish is a bit more bitter than I care for, but not beyond my tolerance. I'm curious to see how it tastes in six months, if it lasts that long. Use the new temperature controller I purchased from Amazon.com. In tests with an insulated cooler and seedling mat, I was able to properly maintain conditioning temperatures for my last two batches of beer. This controller is better quality than my other one and is much easier to set and calibrate. (Here's a link to it, in case you want one for yourself.) This should keep my fermentation temperature closer to 72F and dial back the warming element in this beer. As I learned two batches AFTER making this beer, I need to adjust my sparge water calculation and possibly extend the mash time. On a later batch, those two adjustments allowed me to exactly hit my target gravity and post-boil volume. Use a full pound of D-90 and a full pound of D-45 syrup in the next batch. The flavor comes through in this one, but I'd like to punch it up a bit. Make sure my yeast isn't expired and prepare a starter in advance. Use candi syrup to carbonate the beer to a higher CO2 volume. Consider adding some wheat malt or dextrine malt to improve the head and head retention. Dial the hops bitterness back a bit. Maybe aim for 27 instead of 30 IBUs in BeerSmith. This sounds like I think the beer needs a lot of improvement. Trust me, it doesn't. It's a delicious beer as-is, and the batch is disappearing from my cellar quicker than almost any other I've made. Update 4/3/2016: To give you some idea how well this beer is going over with my family, friends, and me, we've polished off about 25 bottles of it in about a month. That's only because I'm consciously trying to keep it around to see how it tastes as it ages. It's a beer I could happily drink any day of the week. The only negative vote it's gotten was from someone who prefers his beers more dry and hop-forward. Put the raisins, vanilla bean paste, yeast nutrient, and cinnamon in a small pot with enough water to cover them. Boil them for at least 5 minutes to extract flavors from all of them. While they're boiling, sanitize a 1-gallon glass jug or other fermentation vessel, a funnel (if needed to get the liquids into the fermenter), and a strainer. Strain the solids away from the liquids in the pot and discard them. Chill the liquid to room temperature in an ice bath. Sanitize the outside of the pot to avoid contamination. Pour the liquid into the fermenter, using the funnel if necessary. Pour the apple juice into the fermenter to fill it. Sprinkle yeast into the fermenter. Sanitize a stopper that fits the fermenter and an airlock. Insert the stopper and airlock into the jug to seal it. Ferment the cider for at least four weeks in a 65-75F temperature location. If you still see activity in the airlock, even if it's a minute or two apart, keep fermenting. When the airlock seems to have stopped bubbling, sanitize ten to twelve 11-ounce or 12-ounce bottles and caps. Drop a carbonation drop in each bottle. 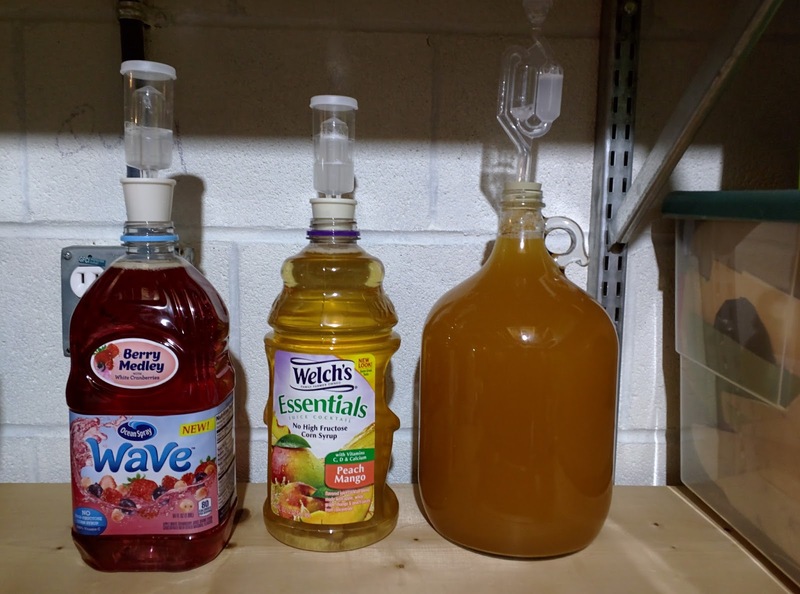 Using a sanitized funnel, carefully pour the cider into each bottle to fill it. Put the bottles inside a cooler or sealed plastic container in case they become overcarbonated and burst. This will keep the mess inside the cooler or container and greatly simplify cleanup if a bottle explodes. After two or more weeks, refrigerate and serve the cider. Overall, the finished cider was relatively dry, with some tartness. The raisin, cinnamon, and vanilla did NOT come through at all. The worst part is that fermentation seems to have brought out a very mild but detectable vinegar-like flavor. Although I could probably give the cider to a number of people and they wouldn't notice it, once I picked it out I couldn't taste anything else. I ended up pouring it down the drain. I don't recommend brewing this one. The raisins, cinnamon, and vanilla added nothing to it. The result was slightly vinegary, and not particularly appetizing. I don't know if I would do this one again or not. Either way, it doesn't live up to the name. If I did do this again, I'd probably leave out the raisins and vanilla and try it with just the cinnamon. That might work better. I'd probably also leave the cinnamon in the fermenter so that the cider had every opportunity to pick up the flavor. UPDATE 2/16/2016: After the very unpleasant initial tasting, I didn't touch the bottles again for another month. They sat in my cellar, undisturbed. Last weekend, I decided to dump the remaining bottles down the drain and re-use the empties. I opened the first bottle and took a whiff of it. No hint of vinegar. I poured it into a glass carefully to avoid the sediment. It looked much like the photo above. Tentatively, I sipped it. The cider was a little tart, but not sour. There was no longer any hint of vinegar to it. Unfortunately, no hint of the cinnamon or vanilla either. I wound up drinking it and not dumping the remaining bottles. It goes to show something I once read about brewing... There are few mistakes a brewer can make that time can't correct. So it seems here. I still have no intention of making this recipe again, but I don't plan to dump it, either. If not bottling and carbonating, refrigerate and drink. Remove the airlock from the juice bottle and carefully pour it into the funnel, filling up the bottle. Try not to disturb the layer of yeast on the bottom of the juice jug. Repeat until all that's left in the bottle is the milky, yeasty bit. Discard the yeasty bit. At the end of the fermenting or carbonating period, the cider is ready to drink. The finished cider maintains the very pale yellow color of the original juice product. It has an aroma of peach, mango, and green apple which is very enticing. The flavor is a mixture of a Granny Smith apple-like tartness combined with a hint of sweet peach and mango flavors. It would be fair to say it's pretty tart, similar to a Jolly Rancher green apple candy. It is less sweet than the Berry Medley cider, but not dry like EdWort's Apfelwein. The flavor is pretty simple and soda-like in nature. In my case, I probably didn't ferment the juice long enough (even at 3-4 weeks). Some bottles had a tendency to gush when opened. The rest, like the one in the photo below, had a very champagne-like carbonation which created a finger-thick white head that vanished almost immediately. It's a much less dry and less tart beverage than the same juice fermented with champagne yeast, so overall I like it much better. Increase the size of the batch to 5 gallons instead of a half-gallon, and use the whole yeast packet and a scaled-up quantity of yeast nutrient. This will also mean using a 5-gallon fermenter. Consider adding brown sugar, cinnamon, ginger, vanilla, and/or nutmeg to it, to increase the complexity of the flavor a bit. Adding the spices would probably be done by creating a "tea" using vodka or grain alcohol to soak the spices and extract their flavors. Increase the fermentation time to six weeks to see if that dries it out a little bit and solve the "gushing" problem. Sanitize a chunk of bourbon barrel and place that in the fermenter to add complexity. 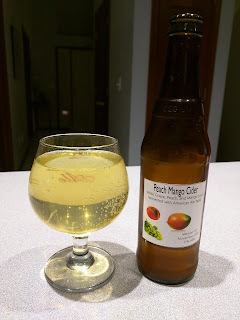 In the previous post, we looked at three different ciders I attempted to make after reading Mary Izett's book Speed Brewing: Techniques and Recipes for Fast-Fermenting Beers, Ciders, Meads, and More.While none of the recipes I did were actually in the book, it is fair to say that the book inspired me to try them. Based on Izett's suggestion that American Ale Yeast would yield a sweeter, fruitier cider, I decided to try fermenting three different juice mixes with it. The first cider created in this way was made using Ocean Spray's Berry Medley flavor Wave Juice Drink. According to the label, it contains filtered water, cane or beet sugar, apple juice from concentrate, white cranberry juice from concentrate, fumaric acid, malic acid, natural flavors, citric acid, ascorbic acid, and carrot extract for color. It has 21 grams of sugar per 8 ounce serving. The cider carbonates very well and retains a champagne-like level of carbonation as you drink it. The color becomes a bright pink, similar to a white zinfandel wine. There is no head, and no lacing is left behind on the glass. The flavor is very sweet, and the berry flavors come through clearly in both the aroma and flavor. It's extremely easy to drink and reminds me of a berry-flavored soft drink. Ingredients for this batch will cost about $4 total at current retail pricing, though you'll have to buy more yeast and carbonation drops than you need if you don't have them on-hand already. Unfortunately, I didn't take gravity measurements on this one, so I can't calculate an alcohol percentage. We have fresh mint growing at the house, so I might make a mint "tea" with some vodka or grain alcohol and add it to flavor the juice. I might also consider adding cinnamon, mace, nutmeg, anise, ginger, coriander, clove, or vanilla to it to increase the complexity of the flavor. Although it's very pleasant to drink as-is, it feels more like a soft drink than an adult beverage. Given that I already have a the bottling, capping, and sanitizing items around as part of my beer brewing equipment, the cost of a batch of this cider is low enough that I could try several different flavor combinations until I worked out something I really liked. I could then scale that up to a five gallon batch (which would cost about $20-25 to make).